This is one of those offices that screams to be chosen for our Workspace of the Week feature. It’s brilliantly organized (check out the image notes for details), a creative use of resources (look at the window/dry erase board in the upper right-hand corner of the picture), and it has an amazing view (Brooklyn by day, Manhattan by night). In fact, I’m already brainstorming ways for how I can incorporate some of Rephlektiv’s ideas into my home office. What a terrific entry! Are any of these people available for hire when I recreate my office space? I am impressed with the organization. I definitely tend to be organized as well, but not nearly as innovative with it. The dry erase board is perfectly located. As a matter of fact, the only potential problem I would have with the workspace is the potential glare on the monitor (i do video so a dark room is preferred). But other than a silly personal preference, this is incredible! What a beautiful and clutter-free setup he has. However, I imagine that chair has to be very uncomfortable, especially when you’re working all day. Just to clarify the comment above…i clicked on the picture and realized there are shades that block some of the glare. Definitely don’t forget to click on the pic like I did. Really breaks everything down, plus…. Now I want to draw on the window! Pam you’re right, that chair is unbearable! I have an aeron chair that is up in Vermont at the moment. It’s been a hassle trying to get it back home! Wow. I really like this one. Wow, I’m in love. Now I have even more reason to lobby for that window-side cubicle! That’s a fantastic view. When I lived in Brooklyn, all I could see from my office was the apartment building courtyard besides me. As beautiful as this is to look at, I really think it would be hard on one’s eyes unless you lowered all the shades during the day. I just double-checked OSHA’s ergonomic website and they mention that glare like this can cause eye fatigue and headaches. I know I’ve experienced that when I’ve looked from the screen to a window and my irises went bonkers. In general, it’s better to have your screen at a right angle to bright windows, which would be hard to do in this bright an lovely room. I love how it’s so Ikea 🙂 It’s a wonderful space. I just know I wouldn’t be able to accomplish anything with that view! 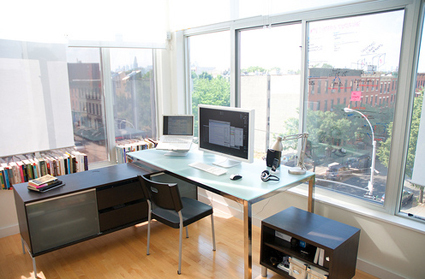 Clean, uncluttered and beautiful….the best office EVER! The glare was a big challenge which took me a few weeks and a few hundred dollars on the cheap end to remedy. The trick that makes this office work is which direction the building is facing (north). During the late morning and afternoons, no light is ever directly coming into the office making working conditions ideal with the windows fully exposed. (This was the time of day the photo was taken) Having the back of the monitor facing the windows fixed most of this glare. The two tricky times were morning when the light came in low and strong from the one far right window (between 6 to 8am) and during sunset when light came in strong on the left set of windows. There is 20% tint on the windows to the left (seen in the photo) this allows plenty of light to come in during the day, but filters any strong light during sunset making it completely enjoyable to use. The morning light is tackled with strategically placed tint on only the upper quarter of the far right window. This is the only panel of glass that any strong light comes in during the AM. When i first set this office up, i thought i’d never be able to overcome the glare issues! I thought great, now this office is useless by having too much light! But with a little research, some 20% tint, and some pull down shades.. I can quickly adjust which side light comes into the office on the fly. Hope some of this information helps others who might be struggling with light/glare issues! Fabulous office! It reminds me that I am staring at a wall that has nothing pretty on it when I use my own desk. My most productive years were spent at a desk that faced a window with a lot of nature to watch. Thanks for the motivation to install the shelf and photos that are waiting to dress up the blank wall! Why does it look like there is no ceiling? I first thought that you had a rooftop office! Deb – Ha! I wish it was that open! The ceiling (and windows!) are vaulted extremely high up making it difficult to capture the whole room. The windows extend another 3ft above where you can see in the photo. High ceilings are a great way to feel less confined. I have 12 foot ceilings here in my Arizona home and the same square footage in this house feels vastly larger than my previous older home with 10 foot ceilings. I love that office Mac! I read the flickr information embedded in the image and FINALLY understood why I keep seeing desks with a desktop monitor and a laptop at the same time in some of these workspace pictures. Not being from New York, I’m afraid I don’t exactly understand how the view can change from Brooklyn by day to Manhattan by night. Is it because you can see the Manhattan skyline when it’s dark? Thanks!! Shannon, bingo! – there’s more to see that’s close to me during the day, but at night the Manhattan skyline lights up making it more interesting to nocturnally gaze at. That Ikea chair, while not the most comfortable, is quite enjoyable to sit on for long times. I have to say, this is one of the best workplaces of the week we’ve been shown in quite a while. Fantastic!